Some call him the "king of casual clothes" because in less than three decades he converted a tailor shop he inherited from his father into the multimillion-dollar Uniqlo empire, the brand that competes with Zara and H&M for dominating the global clothing market. At 69, Tadashi Yanai is the second richest man in Japan, with a fortune estimated at US $ 21,000 million, according to Forbes magazine. 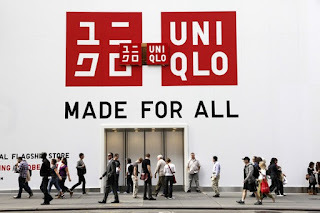 Uniqlo, its best-known company, has more than 1,900 stores in 18 markets and has become the largest chain in the sector in Asia. His goal now is to become the first in the world, but to achieve this he will have to overcome first the Spanish Inditex, which has the Zara brand, and the Swedish H&M. "When you are going to compete in the Olympic Games, nobody will be excited if you say that your goal is the bronze or the silver medal," Yanai said in an interview with the Japan Times newspaper. According to Milton Pedraza, founder and executive director of the market analysis consultancy Luxury Institute, the entrepreneur has been a scholar of the successes and failures of the industry. "He has analyzed the best firms and has internalized the lessons to offer a captivating value proposition," Pedraza tells BBC Mundo. "Yanai is humble and known to be phenomenally innovative," he adds. Other analysts, although they recognize him as a great strategist, say that he is too controlling of the business and that he interferes even in the smallest decisions, including even the colors of some garments. A managerial style that would have already distanced some executives of the company. His father, Hitoshi Yanai, had a tailor shop that made formal suits for gentlemen in the industrial and mining town of Ube, in southern Japan. As an only child, he would be in charge of the family business, but before that happened he went to study economics and politics at the University of Wasedak, in Tokyo. As he himself remembers, at that time he listened to jazz and participated in the student protests against the Vietnam War. Such was the effervescence in the late 60's, that the university closed for a few months and Yanai went on a trip to the United States and Europe, in what would be a trip that "opened his eyes" and taught him more about what he had learned in college. He was impressed by the expansion in the market of chains such as Gap and when he finally took over his father's business in 1984 (which consisted of 22 stores) he decided to turn it into a low cost casual clothing company in Hiroshima. He put Unique Clothing Warehouse and in 1988 shortened the name to the Uniqlo brand. A decade later, he had opened 300 stores in Japan. Married and with two adult children (one of them is currently working in Uniqlo), Yanai loves to talk about the failure. In his autobiography One Win, Nine Losses insists that falls are opportunities, something that he had to live in his own flesh. His first incursion abroad was a disaster: he had to close the stores he opened in London because the business did not work. Similar experiences happened in China and the United States, markets where he had high expectations but things happened much more slowly than he expected. But since Yanai seems to be a determined person, he insisted on these markets with new strategies until he managed to open hundreds of stores around the world. To enter new markets and improve its position in Japan, Yanai had to reinvent the brand. In his native land, the firm had become known for its typical "fleece jackets" and other casual-sports style clothing considered as cheap and of low quality. To change that image, in 2004 the company released a "Global Quality Declaration", with which it planned to go out and conquer the world. It launched clothing lines with new designs and textiles that incorporated technology to obtain the best results in different types of weather. "I'm not interested in being the cheapest," Yanai said in a UK interview with the Telegraph newspaper. For some years the company has concentrated on creating fabrics that are the result of technological research to improve its quality for practical purposes. "Uniqlo is not a fashion company, it's a technology company," Yanai said. The change in clothing fabrics was accompanied by gigantic campaigns to position themselves in another market segment. He opened stores in the most exclusive sectors of the capitals, hired internationally renowned designers and artists, in addition to making alliances with personalities who have worked in the magazine Vogue Paris. And to promote its sports line, he sponsored tennis players such as Novak Djokovic, Kei Nishikori and Shingo Kunieda, as well as Australian golfer Adam Scott. Yanai himself is a golf lover who ordered to build a miniature golf course in the garden of his mansion in Tokyo. But success in sales has been accompanied by protests by workers in some countries. At the end of February there was a protest in London to demand the payment of US $ 5.5 million in compensation for the dismissal of 2,000 workers in Indonesia. Activists projected messages against Tadashi Yanai in the famous Tate Modern gallery that said "pay the employees who have made you rich". And two years ago there were several complaints about the working conditions of workers in companies subcontracted by Uniqlo in Asia to manufacture clothes. The complaint is usually the same: Uniqlo is responsible for overseeing the firms that provide services. Despite these questions in the production chain, Yanai argues that her company has a high profile of social responsibility that is materialized in philanthropic donations and support to international campaigns for humanitarian causes. With several technological research centers that try to work on the fabrics of the future, Yanai tells everyone who wants to hear that their goal is to increase sales of Fast Retailing (the parent company of Uniqlo) and become the largest clothing company in the world in 2020. Industry analysts say the challenge will not be easy because competitors have also set great goals, although the strategies are different. Takahiro Saito, an expert consultant in the fashion industry, wrote in his book "Uniqlo vs Zara" that one of the keys to the success of the Japanese firm has been selling clothes that "practically everyone can wear, regardless of the taste that have in fashion ". On the other hand, says Saito, Zara's strategy is based on the sale of high-quality fashion garments, but at reasonable prices. A similar opinion has Milton Pedraza, who believes Uniqlo has expanded because it is committed to clothing that "never goes out of fashion". "It appeals to consumers of all ages, ethnicities, genders and incomes, it is a successful competitive formula that has been handled correctly," the analyst adds. There is little time for Yanai's self-imposed deadline to overcome his rivals and, for now, it is not clear if he can achieve it. However, the entrepreneur remains true to his goal. "Digital information and innovation will determine who will be the winner," Yanai told Forbes Asia magazine. And although he is about to turn 70, the billionaire shows no signs of wanting to retire. On the contrary, he insists that he is never really satisfied and that he likes to climb mountains because he enjoys the ascent.